This is a gorgeous ball gown with horse hair skirt. The top has beautiful lace and beaded detail. The horse hair skirt makes the dress so fun and gives it a beautiful shape. Definitely a statement dress! I had it dry cleaned and preserved right after my wedding so it is in perfection condition. The neckline was raised 1in for more coverage over the bust. I am 5'7" and wore flat shoes and the dress went to the floor. I also added a few extra embellished lace pieces and a bustle. Small tabs were added on the inside of the bust line so you can tuck them in your corset or bra so it does not slip or pull away from your body. There is also a piece of embellishment added to hide the top of the zipper. 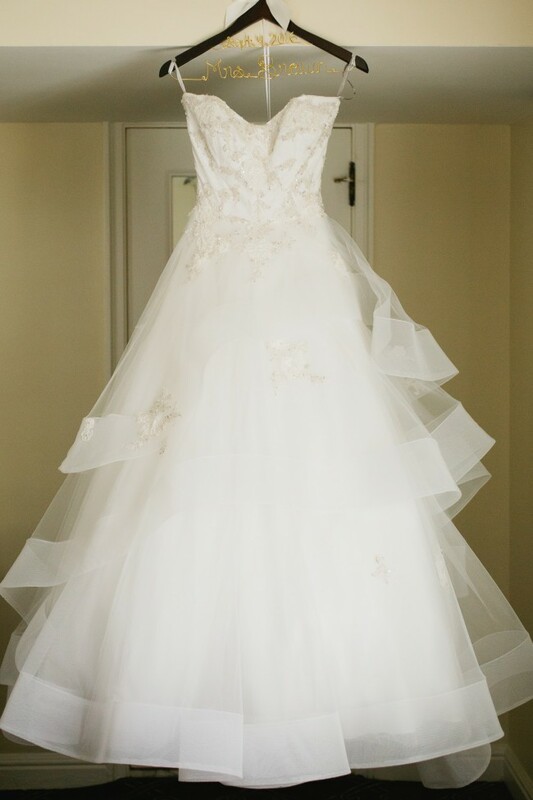 The tailor did a beautiful job and I was so happy with how it fit on my wedding day- the dress did not fall at all and was so comfortable.